AV-15PMC series pressure type manhole cover is mainly used on pressure tanks for food, beverage and pharmaceutical industries, etc.. Working pressure: Max. : 5bar; Min. : Vacuum. 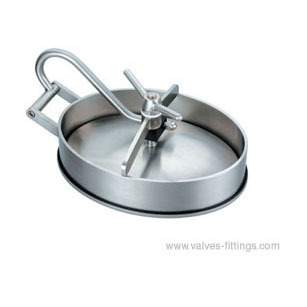 AV-15NPC series non-pressure type manhole cover applies to all kind of atmospheric containers or tanks to prevent leakage; it is widely used in food, beverage, brewing and pharmaceutical industries. Non-pressure type manhole cover can be used under normal pressure, so it has only one fixed hand wheel device and is with good sealing.